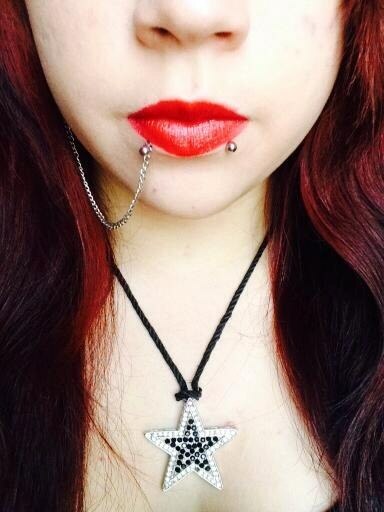 The snake bite piercing is definitely one of the most unique lip piercings there is. If you want to get something unusual and you feel like you need to stand out from the crowd, the go ahead and get a snake bite piercing. Today, we will discuss everything that you need to know about the snake bite piercing. 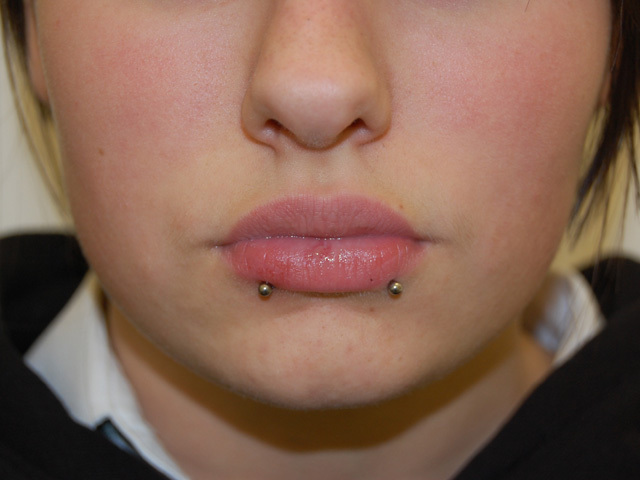 We will also be showing you some pictures for inspiration if you are planning on getting this piercing soon. 1 What is the Snake Bite Piercing? 3 Will the Snake Bite Piercing Hurt? 8 When will my Snake Bite Piercing Heal? What is the Snake Bite Piercing? 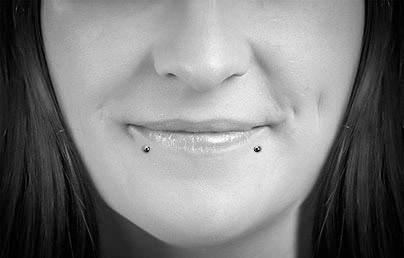 The snake bite piercing consists of two different types of piercings – one on the left side of the bottom part of the lower lip and one on the right. It is called “snake piercing” simply because it looks like a snake bite. 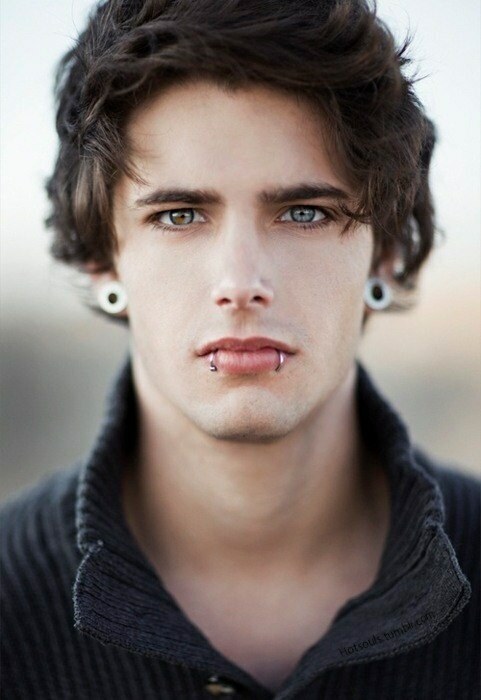 Both men and women are keen on getting this type of piercing, as it looks good on both genders. 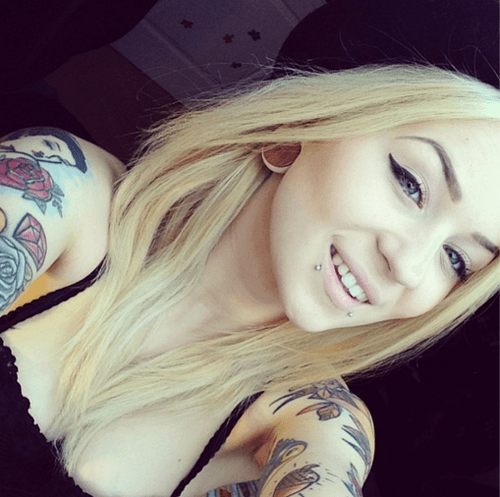 When it comes to the snake bite piercing procedure itself, the steps are pretty similar as to what you can usually expect with any other facial or body piercing. First, the piercer will give you a piece of paper to sign. This is called a consent form, which frees them from all of the responsibilities if ever something happens to your snake bite piercing. After this, you will be asked to choose the jewelry that you would want to use for your snake bite piercing. Then, they will sterilize all of their tools before going into the procedure. They will also clean and disinfect the area to be pierced and put a mark on it to make sure that the piercing will be precise. Next, they will ask you to be ready as they pierce through your bottom lip. The hollow needle will then go through, followed by the jewelry. They will then clean the area once again and give you the aftercare tips that you should follow. These procedures will be done twice, as the snake bite piercing consists of two different types of piercings. Will the Snake Bite Piercing Hurt? 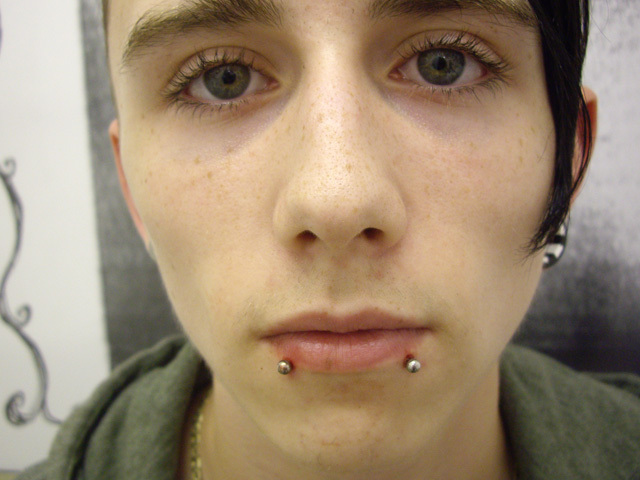 Every type of piercing, either on the face or on the body, will hurt at some point. Fortunately, the initial pain will only last for a few seconds. The pain during the healing period will last for about a week or so, depending on how you take care of it and where the placement of the piercing is. For the snake bite piercing, you can expect the initial piercing pain to be a little bit more intense. 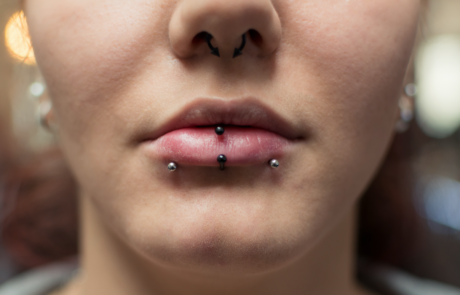 The lips and the area around it is packed with sensitive nerve endings, which is the reason why you will feel more pain compared to other piercings. You will definitely feel a bit of throbbing and tenderness around the piercing for a couple of days. If it lasts for a week or so though, then it might mean that you have an infection and that you need to see a doctor as soon as possible. Also, keep in mind that everybody’s pain threshold depends per person. While some people may say that the snake bite piercing is not painful at all, some may find the pain to be a little bit more intense. Also, you might feel a little bit of pressure or pain from the clamps that will be used to hold your lower lip. This is for the piercer to see where they will place the piercing exactly. This will only last for a few seconds though, so you would not have to worry about it too much. It’s hard to tell exactly how much the costs of a snake bite piercing will be, as all of the piercers and shops have different pricing when it comes to this. The average cost of a snake bite piercing is at around $80 – $120, but it still depends on several factors such as the experience of the piercer, the location of their shop, and the jewelry that will be used for the piercing. You would have to remember that you will be getting two piercing technically, as the snake bite piercing is made up of two different holes. There are certain things that you can do before getting the snake bite piercing to make sure that all will go well. Read on below to know what they are. Before the day of your snake bite piercing, make sure that you have got lots of rest. This will make you feel more relaxed and energized, giving you a higher chance of having a successful piercing. Also, if you are currently sick during the day of the piercing, then it would be best to delay and reschedule the piercing until you finally feel better. You would need a strong immune system for your piercing to heal properly, so it would be best to have it when you feel a hundred percent better. It would be best to lay off the alcohol and drugs at least days before your actual snake bite piercing. Alcohol is a natural blood thinner, which means that your snake bite piercing has a high chance of bleeding out if you decide to get pierced while you are intoxicated. Drugs, on the other hand, can make you feel sick and lethargic, which can lead to your immune system taking a dive for the worst. 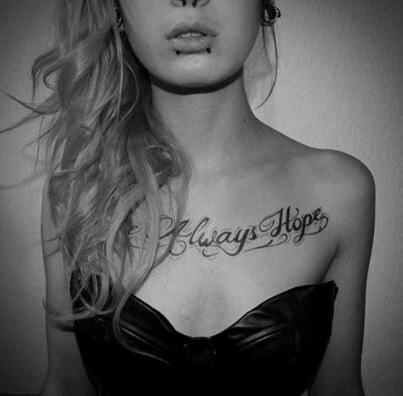 We already know that a bad immune system and piercings do not match, so make sure to keep off the drugs at least for a while. After getting your snake bite piercing, you would most likely want to go straight home and rest. Make sure to grab everything that you need for the aftercare including some sea salt, a pack of cotton balls and rounds, and some q-tips. The best way to clean your snake piercing is by soaking it in with a sea salt solution. This is gentle enough and won’t irritate your snake bite piercing. Avoid washing it with antibacterial soap, facial wash, and water, as this can be too harsh for your brand new piercing. Instead, clean it with a piece of cotton ball and sea salt solution. Soak the cotton ball in the sea salt solution and hold it on your snake bite piercing for a couple of seconds. Do not pull or tug on it, as this can further irritate the piercing. You should also avoid putting creams, oils, and other types of ointments on your piercing while it is still healing. Stick to the sea salt solution and you’ll be good! Your piercer should give you aftercare instructions after giving you the piercing. We’ll also be giving you some tips to make sure your piercing will heal properly. We all know how smoking can leave traces of nicotine and other chemicals inside the mouth. These chemicals can irritate your piercing and can even leave you with a nasty infection. You can instead try chewing a sugarfree gum if you ever feel the need to smoke for the meantime. Spicy and super sour food can burn your new snake bite piercing if it ever comes to contact with it. Because of this, you might want to avoid it for the time being. Alcohol is a no-no too, as this can extremely dry your piercing up. Similar to spicy food, it can also sting when it comes to contact with the piercing as it literally contains some percentage of alcohol in it. Don’t clean it too much but also, don’t slack off on cleaning your snake bite piercing. Cleaning it with a saline solution twice to thrice a day is sufficient. To make the solution, grab one tablespoon of sea salt and one cup of warm water. Dissolve the sea salt in the water and mix until the sea salt is completely dissolved. You can then take a q-tip, dip it in the solution, and place it on your snake bite piercing. You can also take a cotton round or ball, dip it in the solution, and press it gently on your new piercing. Leave it to dry afterwards or gently pat with a piece of clean tissue. If you can, avoid using things such as makeup, tanning lotion, toners, moisturizers, and perfume on or near the snake bite piercing. A new snake bite piercing is very sensitive and these things can only irritate it. If you really need to apply some of these on your skin, make sure to avoid the piercing and just go around it. You should also not slack off on brushing your teeth twice to thrice a day to keep the bacteria at bay. Avoid brushing the piercing though, as this can irritate it. Gently brush your lower front teeth and if you need to, grab your lower lip to make sure you won’t bump on the snake bite piercing. You can also floss your teeth and use an antibacterial mouthwash twice a day to make sure that the extra bits of food won’t get into your piercing. Most people do not realize that touching their new snake bite piercing can actually hurt their chances of being infection-free. Refrain from touching your piercing, especially if it is just a few days old. If you ever have to touch it, make sure to wash your hands before doing so, or at least put a pair of gloves to avoid transferring the bacteria to your piercing. You should also avoid playing with it with your tongue or hands, as this can irritate the piercing. Do not replace the jewelry right away after getting the piercing. Doing so will only irritate your snake bite piercing and may even cause an infection or even bumps and scars. You would have to wait until your piercing is fully healed before you can even replace it with a new jewelry. You do not want any food getting caught up in your snake bite piercing, which is why you have to be careful when eating with a new piercing on. Also, some types of food can get entangled with the disk or the barbell, causing the skin on your lip to tear. Just be mindful when eating to prevent things like these from happening. When will my Snake Bite Piercing Heal? You can expect your snake bite piercing to fully heal within two to four months. However, you have to remember that some people can heal faster while some can take a little bit more time to fully heal. Always follow your piercer’s aftercare instructions to make sure you won’t get an infection and that you will be on the right track for healing. 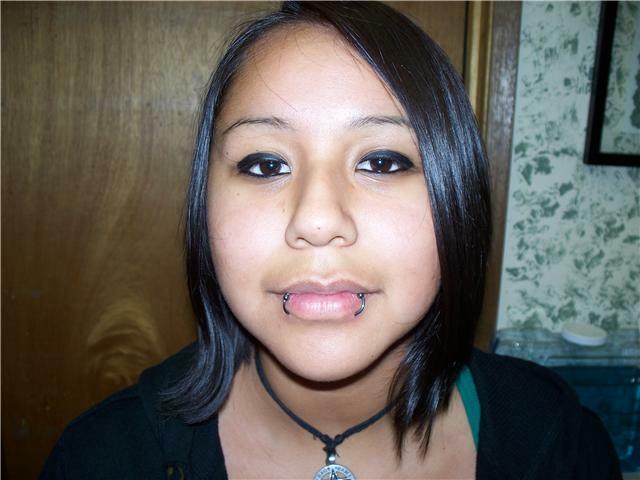 As with any other piercing, infections can happen at times. Although this is not that common, it would be best to be aware of it so you would know how and when to take action. If you feel like you cannot talk or eat properly because of the swelling, then go ahead and visit the emergency room. This is definitely a cause for concern, as swelling might mean that you have an infection. Redness is common for the first few days, however, if it gets to the point where it lasts for more than a week, then you definitely should be concerned. Make sure to call your doctor and have them check the area if you feel like the redness is not going away. Rashes and fever definitely mean that you have an infection present in the area. Always seek your doctor’s help if it comes to a point where you get a high-grade fever or severe rashes right after getting your piercing. Sure, it is normal for your new piercing to be tender and painful during the first few days, but if it lasts for more than a week, then you probably have to be worried about it. Have your doctor take a look at it and ask for possible remedies. Listed below are some risks associated with the snake bite piercing. This literally means that your snake bite piercing jewelry can get embedded to your lip itself. This may happen if the jewelry hasn’t been touched for a long time or has been there for a couple of years. To avoid this, take your jewelry out every once in a while and let your lip rest for a few minutes or hours. Do not remove your jewelry until it is fully healed and avoid leaving your piercing without any jewelry for days to avoid the hole from closing up. Since a part of the jewelry is inside your mouth, it is inevitable for it to rub on your lower front teeth. This can cause your teeth to eventually thin out and get worn out after a while. Your teeth enamel can chip away and can even cause erosion within your teeth, which can then lead to tooth decay. Always check with your dentist about this matter to make sure you avoid decaying and destroyed teeth. Since the jewelry is also rubbing on your gums every so often, the snake bite piercing can cause your gums to recede. This can cause the teeth to become loose, which can lead to tooth decay or even tooth loss. You may also feel some type of sensitivity if this happens for a long time, so make sure to check on your teeth and gums always. It’s fairly easy to contract a disease through unsanitized and even used needles. Always check and see if your piercer is using a brand new needle for your snake bite piercing. If not, then ask them to. There is always a risk of infection for the snake bite or any type of piercing. Always follow your aftercare instructions, brush, and rinse your mouth properly to avoid contracting an infection. Below are a few samples of the snake bite piercing. Enjoy!